In 2014, I got into a heated conversation with a colleague. 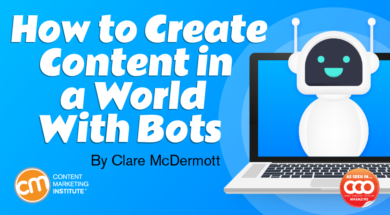 He argued that, within just a few years, robots would replace writers in content marketing. I rolled my eyes so hard my brain ached. The idea of machines crafting sentences as elegant and nuanced as a human writer could was both heretical and impossible, I thought. Turns out he was right, but the development isn’t the sci-fi creative dystopia I imagined … in most cases. Today, companies indeed use machine learning to generate natural language, and marketers are using AI-powered tools like Narrative Science and Automated Insights to produce practical, well-constructed, high-performing content. All sounds well, yes? Not so fast. Some applications for robo-writing are deeply problematic – not because the quality of the language they generate is poor, but because it’s believably human. I’ll get to that, but before I raise the red flag of caution, let’s talk a bit about the full range of applications for robo-writing available. Modular content: Highly templated, formulaic content; it’s often data-driven, and the scale and scope of those content projects make them fantastic candidates for machine-made content. Creative support: Tools that give writers superpowers; rather than writing from scratch, these AI-powered tools enhance the creative and analytical powers of human writers. Messaging chatbots: Interaction bots, powered by AI and using natural language processing, sustain one-on-one conversations with prospects and customers – through social media, web applications, or even email. The most exciting opportunities for using modular, machine-made content are the types of projects that are predictable, repeating, following a template, and in most cases highly reliant on data. Today, these tasks are completed by machine-learning technologies. The Associated Press, for example, uses robo-writers from Automated Insights for corporate earnings calls. AP freed up 20% of reporters’ time, reduced errors, and improved turnaround times. AI tools also help companies convert data into stories. Dominion Dealer Solutions enables auto dealers to create customer-ready profiles about the cars on their lots. In the past, a dealer might cut and paste information from disparate sources to create a sell sheet – a process wildly impractical for dealers with thousands of new and used cars in inventory. Using Narrative Science, dealers can access a sell sheet in real time, unlocking plain-English descriptions from a massive trove of vehicle data. This application isn’t simply about the sales sheet, of course; it’s also about SEO. Using robo-writing helped Dominion Dealer Solutions increase page views by 20% (including a 50% lift in page views across used vehicles), as well as increase inventory revenue. These cases show AI replacing humans, yet there are plenty of examples of AI supplementing the work of human writers. To understand the future of robot-assisted content, it’s useful to look at the manufacturing industry, where more companies are using “cobots” – robots designed to interact with and assist humans in a shared space. Cobots often perform repetitive tasks in partnership with a human (e.g., packaging, pick-and-place tasks, quality checks) and eliminate or minimize the more tedious and dangerous tasks on assembly lines. AI-powered writer-support tools look a lot like the relationship between humans and cobots. The most common content cobots are Google’s Smart Reply and Smart Compose features in Gmail. As you type, Google predicts the words that likely follow. To date, predictive content cobots like Google’s don’t deliver on the promise. Google’s Smart Compose isn’t particularly time-saving: The keystrokes required to complete the sentence are awkward enough that in most cases it’s simply faster to type the same words. Aside from these types of predictive, natural-language-processing cobots, there are dozens of creative-support cobots on the market. Among my favorites is Frase, an AI-powered word processor with an integrated research assistant. As I write a story, Frase searches for third-party media and research, and summarizes relevant sources. The tool even creates footnotes/endnotes based on the information cited. Frase isn’t intended to replace human storytellers but rather make them more efficient and effective. All this seems relatively benign, no? For the most part it is, but a small and growing number of AI-powered interaction tools are blurring the line between machine-made content and something more disturbing. Marketers are aware of chatbots – AI-powered interaction tools that can answer simple customer questions and replace the role of humans for more mundane conversations. Most chatbots divulge their machine identity in these interactions, even though an astute observer can usually tell when they are interacting with a machine. But all this will change quickly. Lisa-Maria Neudert is a doctoral candidate at the Oxford Internet Institute and a researcher with the Computational Propaganda Project. Among other things, she studies how businesses and political groups use chatbots to interact with their audiences. Lisa-Maria predicts that as machines become more adept at imitating the quirks of human language, as well as carry on wider-ranging conversations, people will be a lot less able to identify bots. And this change will make it easier for bad actors to exploit chatbots. She explains, “(Propaganda bots) will present themselves as human users participating in online conversation in comment sections, group chats, and message boards.” What is particularly frightening about the development is the ability for bots to engage in highly customized, one-on-one, private conversations … and to do this at scale. Yet, good examples aside, it won’t be long before marketers can develop messaging chatbots that can so closely mimic human language they will be tempted to use them more covertly. While marketers don’t have to divulge when content is machine-made, they absolutely should when conversations are machine-made. California has a law — dubbed Botaggedon — that says companies must disclose when users are interacting with a bot (e.g., “Hi, I’m a bot”). The law is directed mostly at social media chatbots, leaving companies to figure out how to apply it to other use cases. Despite the legislation in California, marketers are in a gray space with the technology evolving more quickly than the regulation of that technology. Just look at the way governments are playing catch-up to the privacy misdeeds of companies like Facebook. People have known for years that Facebook, Google, and thousands of other smaller players are monetizing people’s personal data. But governments and consumers were slow to realize the implications of this data exchange. Given that regulation won’t likely arrive in time to curb bad behavior with machine-generated conversations, perhaps consumer choices will. A study from the Pew Research Center in October 2018 found that only half of U.S. consumers believe businesses using bots to promote their products is acceptable (not exactly a ringing endorsement). And among those who have a higher level of understanding of what bots are, the acceptance rate is significantly lower. As marketers race to find new and different ways to reach their audience (hello obnoxious lock-screen advertising, uninvited text messages, and web browser notifications), consumers are finding new ways to limit access. Ultimately, it’s still about the message, not the method. Publish great content, provide useful information, and your audience will open the door to let you in – whether that content is created by machine or human. Engage in more content about robo-writing – take a quiz, explore robo-writing platforms, and more – in the digital Chief Content Officer magazine. And while you’re there, make sure to subscribe.